The Pitch: 50's era, sci-fi styled, 3rd person shooter/tower defense game. It's no secret that EBongo and I are drawn to co-op experiences. Although we end up playing a lot of FPS'es, probably our second most prolific genre is tower defense. I roped him into playing Trenched! (aka Iron Brigade) and we've also played similar titles together like Dungeon Defenders and Orcs Must Die. We also both have something of a Clash of Clans addiction, and that's kind of a long, slow tower defense game if you stop to think about it. Fortified! looks like another promising entry in this genre. We got to play a whole round of the alpha together while at PAX South, and I had a blast. If you've played any 3rd person tower defense games in the past, you'll feel right at home. There's a planning phase where you can construct new buildings, and then a battle phase where waves of robotic enemies attempt to overrun you and destroy your vulnerable core-thing. EB's enjoyment was tempered somewhat by his obvious jealousy of my character's awesome jetpack. I zipped around the battlefield, laying down heavy rocket fire to cover our defensive positions. Each of our primary weapons had a clip that took time to reload, so there's an incentive to swap between your weapons to keep the DPS flowing. Some of the enemies were a bit too smart for our defenses to handle - for instance, there was one robot that rolled up into a ball and sped past our turret line, which we had to deal with by quickly falling back, leaving our defenses vulnerable. Fortified! is still in its early stages, so we didn't get a chance to check out the between-levels upgrade flow, which I was told would allow us to make our defenses and personal weaponry better. 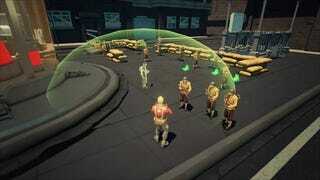 The Bottom Line: If you enjoy a good shooter/tower defense hybrid, keep an eye on Fortified! - strong core gameplay, a retro-sci-fi atmosphere, and friggin' jetpacks make it one to watch.